Fiction – hardcover; Flamingo; 255 pages; 2003. Reading a book by Magnus Mills is a bit like stepping into a parallel universe: everything looks and feels the same but there’s something a little off key that you can’t quite put your finger on. 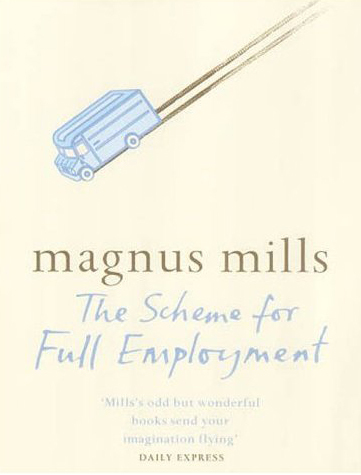 The Scheme for Full Employment, Mills’ fourth novel, is no exception. The Scheme is essentially a distribution business in which goods are transported from depot to depot in a vehicle called a UniVan. The UniVan was a glorious creation! With its distinctive gunmetal paintwork and silvery livery, its bull-nosed profile, running boards and chrome front grill, it had become a celebrated national icon, recognised and loved by all! Moreover, it represented a great idea that not only worked, but was seen to work! Becoming an employee on The Scheme, which runs like clockwork and offers eight hours’ pay for eight hours’ work, is held up as a pinnacle of achievement. What better way can one earn a living than driving a van in a courteous, efficient and timely manner from depot to depot delivering unspecified goods to a rigorous and ordered schedule? But the rigour and order with which The Scheme is renowned comes under threat by revelations that some workers aren’t doing their full eight hour days — some are being signed off for an “early swerve” on a semi-regular basis, so instead of finishing bang on 4.30pm some are going home a half-hour earlier! This authorised skiving is not approved by those employees who believe that such actions will destroy The Scheme’s regimented order they love so much, and a strike — the first in The Scheme’s history — ensues. It’s not hard to see that The Scheme for Full Employment is actually a parody of the capitalist system, poking fun, as it does, at everything from unionised labour to the sheer monotony of many people’s working lives. It’s peopled by characters that derive meaning and purpose to their existence by the dullest of jobs and responsibilities. And it calls into question the hollow nature of businesses, which are set up purely to keep someone in employment. The monotonous routine of The Scheme is echoed by Mills’ own dead-pan humour, his repetitive writing style and his often dull descriptions of people and places. Just as his earlier novels — The Restraint of Beasts, All Quiet on the Orient Express and Three to See the King — featured a working-class narrator as the unwitting hero of the piece, The Scheme for Full Employment offers up a similarly lovable if naive (unnamed) person trying to make sense of a strange and alienating world. While not as humorous and a tad more symbolic than previous efforts, this is still a recommended read for those who want to try something deliciously — and strangely — different. He gives us a peek into regular people’s working lives. The Scheme… is easily my least favourite of Mills’ books. Favourite would be All Quiet on the Orient Express.